I saw “Finding Dory” opening week. I bet a lot of you did, too. Going to the movies isn’t cheap, even if you hit a morning showing on the day kid’s popcorn and drink packs are on sale for three bucks each. I left the movie feeling very unsettled. We need to talk about the way special needs and mental health issues were handled in Finding Dory. Are you listening Disney and Pixar people? I’m disappointed. And I know I’m not the only one. I’ve seen rumblings on Facebook. A lot of people are unhappy with the movie, but can’t quite put their fingers on why. Listen. That third sea lion the other two wouldn’t allow on the rock clearly had special needs. He appeared to have some developmental delays. The other two sea lions were flat out bullies. They teased and taunted him. They were cruel and laughed it up. And it was used as comedy in the film! Just straight up comedy. No one pointed out what jerks the sea lions were being. They didn’t learn a lesson. They bullied a peer and we were supposed to think it was cute and funny. Our kids were supposed to think it was cute and funny. Becky with the good pail. We got that Becky the bird wasn’t the brightest creature with feathers. Again, she was made into a joke – portrayed as less than because she wasn’t as conventionally smart as other characters in the film. She was doing Nemo and Marlin a solid favor by transporting them in a sand bucket, but instead of showing her kindness and appreciation Marlin was impatient, judgmental and rude. Yeah, pretty much how he was with everyone the whole movie. Nemo’s dad, Marlin, did not set a good example for tolerance and compassion. It was his harsh words that caused Dory to go off on her own. Nemo, his child, was the one urging him to be kind and patient to others the whole film. If your child has experienced loss or abandonment, be very cautious of “Finding Dory!” The whole film is about Dory desperately looking for her parents after being separated from them. She blames herself and her disability for “losing” her parents. “Finding Dory” may be very upsetting to kids who were adopted, are in foster care or have suffered the loss of a parent through death, divorce, etc. We adopted our daughter from the foster care system. We spent years working to show her she’s good and valuable and not to blame for what happened in her first family. 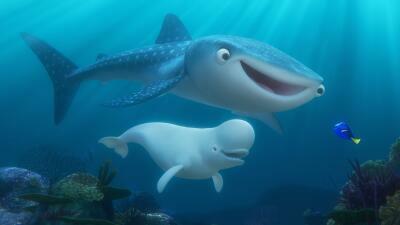 We don’t need “Finding Dory” telling her otherwise – and neither do any other children. Nearly every sea creature in “Finding Dory” has some sort of insecurity, anxiety or difference. Disney Pixar had a wonderful opportunity to make something great – a film that made everyone with differences stand tall and feel good about themselves. Instead they just dished out the same bullying, judgment, jokes and mean comments that are already way too prevalent. Disney Pixar, you dropped the ball on this one.